How's this for fair? Since June 2009, the end of the recession, middle-class income declined while the biggest banks made more money than they ever did. Still, bankers have agitated for loosening rules that might prevent another implosion on the grounds that regulation would crimp their profits. The irony is, without the help of regulators, taxpayers and lawmakers, they'd live more like the rest of the country—struggling to stretch their paychecks to the end of every month and saddled with credit scores that make it unlikely they'll ever be able to borrow anything but hedge clippers from the neighbors. Without Washington as its midwife, their new Gilded Age would never have been born, with its strong whiff of the robber barons of the 1890s. Bankers' rights expanded immeasurably after the crisis. Today, some of them don't pay taxes at the same rate the rest of Americans do; they can use deposit cash to roll the dice in the derivatives casino; they can mix trading oil with the business of drilling for it, shipping it, refining it and selling it; they can continue to defraud the same U.S. government that bailed them out; they face scant consequences for the fibs they tell investors or federal investigators. The heart of the predicament was the growth of the biggest banks. Before the crisis, at the end of 2006, JPMorgan Chase, Bank of America, Citigroup and Wells Fargo had $5.2 trillion of assets on their books. In 2012, they had $7.8 trillion. That's a 50 percent increase. In 2012, Wells Fargo by itself wrote one of every three residential mortgages in America. Usually, growth is a good thing. But this was unnatural and out of control. The big boys had gotten so behemoth that if they coughed in New York, financiers felt the breeze in Singapore. 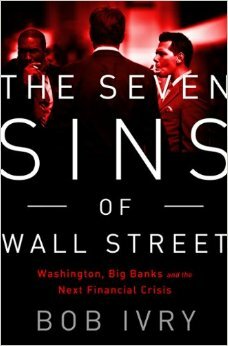 Bob Ivry has written this book to make sure the failure of America will be not be written off by Wall Street as its cost of doing business.